59 Commonwealth is located on the north side of Commonwealth, between Berkeley and Clarendon, with 57 Commonwealth to the east and 61 Commonwealth to the west. 59 Commonwealth was designed by architect Carl Fehmer and built ca. 1874, one of a symmetrical pair of houses (57 and 59 Commonwealth). 59 Commonwealth was built as the home of dry goods and textile merchant Amory Appleton Lawrence and his wife, Emily Fairfax (Silsbee) Lawrence. They previously had lived at 77 Beacon. They also maintained a home in Beverly and, from 1889, in Groton. 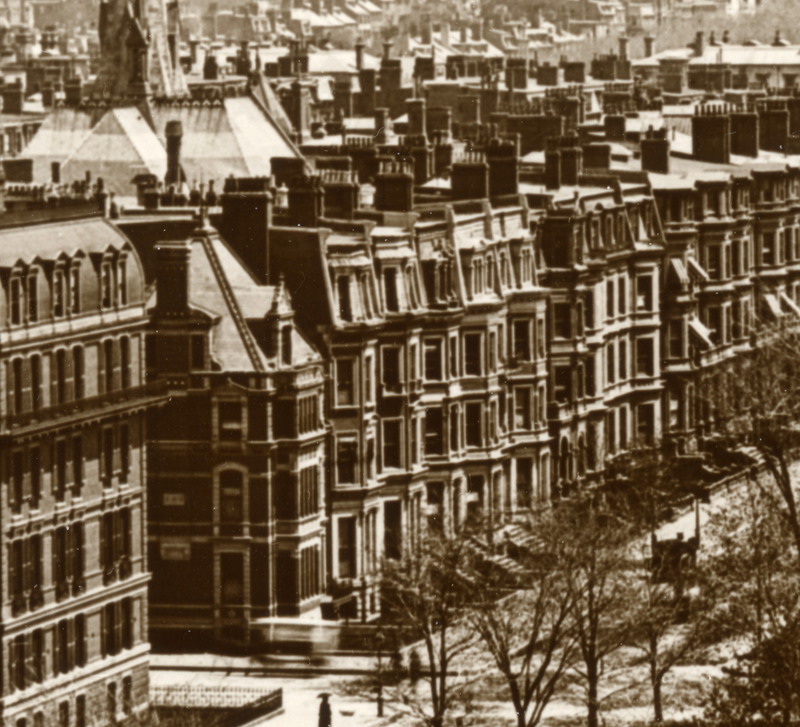 Emily Lawrence purchased the land for 59 Commonwealth on May 39, 1873, from architect John Hubbard Sturgis, who had purchased it from the Commonwealth of Massachusetts on July 8, 1864. Click here for an index to the deeds for 59 Commonwealth. Emily Lawrence died in April of 1895. Amory Appleton Lawrence continued to live at 59 Commonwealth, remarrying in June of 1900 to Gertrude Major Rice. They continued to live at 59 Commonwealth with Amory Lawrence’s children by his first marriage: Amos Amory Lawrence, John Silsbee Lawrence, and Edith Lawrence. Edith Lawrence married in February of 1903 to attorney Harold Jefferson Coolidge. After their marriage, they lived at 147 Beacon (303 Berkeley). 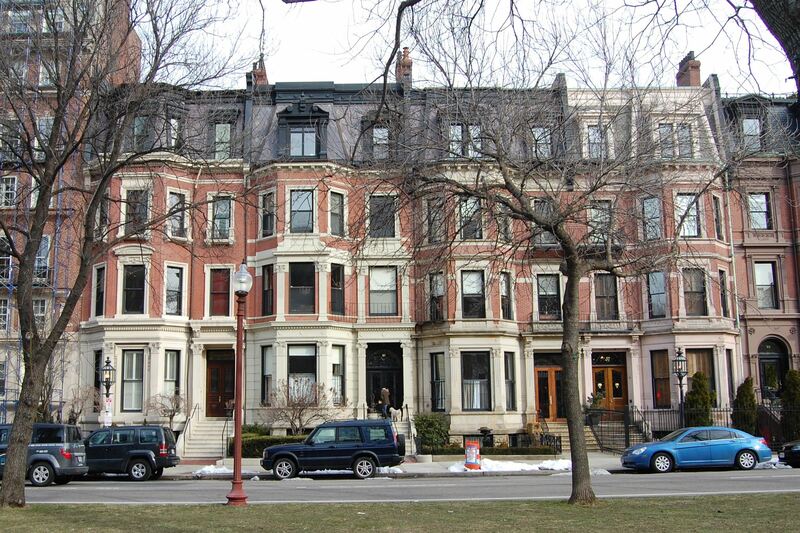 In February of 1904, the Lawrences purchased and moved to 61 Commonwealth. Amos Amory Lawrence moved with them, and John Silsbee Lawrence moved to 24 Marlborough. 59 Commonwealth remained the property of the Lawrence family, who leased it to others. By the 1904-1905 winter season, 59 Commonwealth was the home of Mrs. Alice (Greenwood) Howe, the widow of George Dudley Howe. Her husband had died in March of 1903; prior to his death, they had lived at 179 Commonwealth. Alice Howe was a close friend of the author, Sarah Orne Jewett, who dedicated her book, The Country of the Pointed Firs, to her. Alice Howe also maintained a home in Manchester, the Cliffs, built in 1878, the first residence designed by architect Arthur Little. 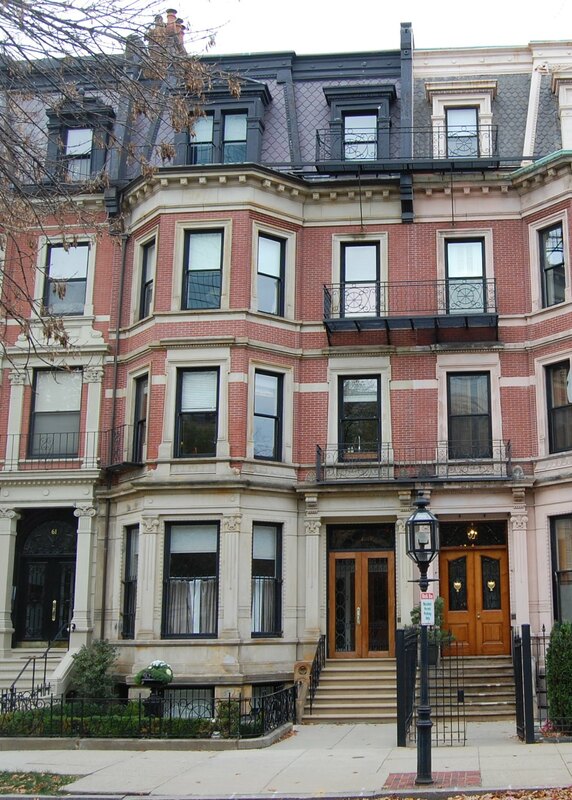 Mrs. Howe continued to live at 59 Commonwealth during the 1912-1913 winter season, but moved thereafter to 265 Commonwealth. On August 28, 1913, John Silsbee Lawrence acquired 59 Commonwealth from his brother, Amos Amory Lawrence, and the trustees under their mother’s will for his sister, Edith (Lawrence) Coolidge. He and his wife, Emma (Atherton) Lawrence, made it their home. They previously had lived at 355 Beacon. They also maintained a home, Gravelly Brook Farm, in Topsfield. During the 1927-1928 winter season, the Lawrences were living at 97 Mr. Vernon, and 59 Commonwealth was the home of banker Westmore Willcox, Jr., and his wife, Esther Leavens (Jenkins) Willcox. 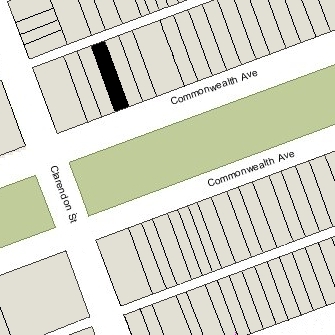 By the 1928-1929 winter season, John and Emma Lawrence were living at 59 Commonwealth again, and they continued to do so during the 1931-1932 winter season, after which they lived in an apartment at 276 Marlborough (16 Fairfield). and in Topsfield. By the 1933-1934 winter season, 59 Commonwealth was the home of Mrs. Susan Jane (Northridge) Taylor Jones, who operated it as a lodging house. She was the widow of Thomas Brierley Taylor and the former wife of David R. Jones. Her sons by her first marriage — William Randolph Taylor and Robert Winston Taylor – lived with her. They previously had lived at 84 Commonwealth. Susan Taylor also owned 121 Beacon, where she operated a lodging house, and she listed her residence both there and at 59 Commonwealth in the Blue Books through 1936. W. Randolph Taylor operated a lodging house at 228 Newbury, and later would become a real estate and furniture dealer. On December 14, 1936, W. Randolph Taylor purchased 59 Commonwealth from John S. Lawrence. On the same day, he transferred the property to himself and his mother. Robert Winston Taylor continued to live at 59 Commonwealth in 1937, but moved thereafter and by 1940 was living in Baltimore, where he was a salesman for a textile machinery company. Susan Taylor Jones and W. Randolph Jones continued to live at 59 Commonwealth, operating it as a lodging house. On September 4, 1942, they transferred the property back into W. Randolph Taylor’s name, and by 1943 they had moved to 169 Commonwealth, which they had acquired and converted into a lodging house. On July 15, 1943, 59 Commonwealth was acquired from W. Randolph Taylor by Ada (Hertz) Bourne Autio, the wife of Matti Autio, and Elin (Villander) Spongberg, the wife of Nels Spongberg. Matti and Ada Autio lived in Maynard; Nels and Elin Spongberg lived at 111 Commonwealth, where they operated a lodging house. On July 3, 1945, 59 Commonwealth was acquired from Ada Autio and Elin Spongberg by Mrs. Alice W. Lauren, who operated it as a lodging house. She previously had lived in New York. She continued to live there until about 1947. 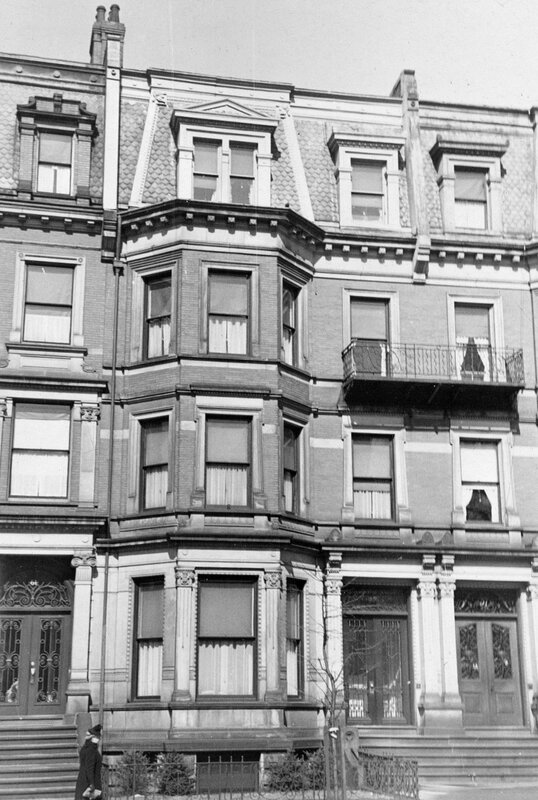 On June 18, 1947, 59 Commonwealth was acquired from Alice Lauren by Herbert D. Gedney and his wife, Mary W. (Hollis) Gedney, who continued to operate it as a lodging house. He was employed with the American Mutual Liability Insurance Company. They continued to live there until the mid-1950s. On February 16, 1955, 59 Commonwealth was acquired from the Gedneys by real estate dealer Hugh Richardson Farrington and his wife, Clara Marcellina (Cormier) Farrington, who operated it as a lodging house. They lived in Arlington. On February 1, 1957, 59 Commonwealth was owned by Elwyn Barnard Buzzell and his wife, Harriet E. (Johnson) Buzzell. They previously had lived at 623 Commonwealth. They continued operate 59 Commonwealth as a lodging house, called Barnard House. On August 30, 1964, Chamberlayne School and Chamberlayne Junior College acquired 59 Commonwealth from the Buzzells and used it as a women’s dormitory. Chamberlayne went bankrupt in the mid-1970s and on April 18, 1975, 59 Commonwealth was purchased from Chamberlayne by Farshid Hodjat and Fariborz Ghadar, trustees of the 59 Common Trust. In April of 1984, the trust filed for (and subsequently received) permission to legalize the occupancy as nine apartments, indicating that the property had been acquired for that purpose in 1975 and used as such since then. On April 13, 1995, John O’Brien, successor trustee of the 59 Common Trust, transferred the property to Akhtar Hodjat (Akhtarolmolouk Amirtahmaseb) of Teheran, who was the sole beneficiary of the trust, and on November 21, 1996, Akhtar Hodjat transferred the property to John O’Brien as trustee of the Akhtar Trust. On May 5, 2000, 59 Commonwealth was purchased from the Akhtar Trust by Julian Cherubini and his wife, Barbara Cherubini, who remodeled it into a two-family dwelling. The Cherubinis were the founders of AliMed, manufacturers of medical, healthcare, and ergonomic products. 59 Commonwealth remained a two-family dwelling in 2015.